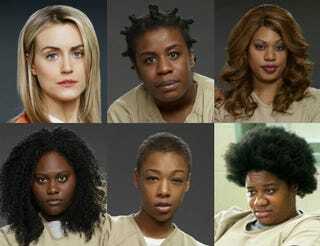 Top row: Piper (played by Taylor Schilling); Crazy Eyes (Uzo Aduba); Sophia (Laverne Cox). Bottom row: Taystee (Danielle Brooks); Poussey (Samira Wiley); Black Cindy (Adrienne C. Moore). All images: Netflix.